Promotion | Stay Protect When You Travel With MSIG! Stay Protect When You Travel With MSIG! For our loyal customers* who have premiums more than 1,000 Baht (per person), will receive Starbucks card or Starbucks e-Coupon top-up 100 Baht. 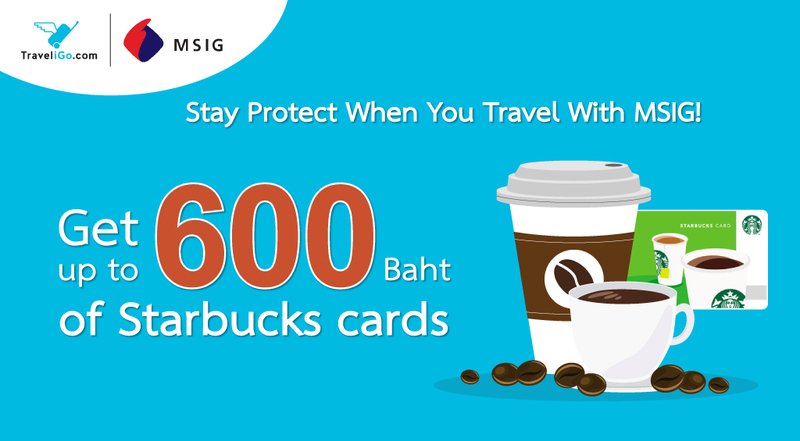 Purchase MSIG Travel Easy, ANNUAL TRIP any plan (per person), will get 500 Baht of Starbucks cards or Starbucks e-Coupon. For our loyal customers*, receive Starbucks card or Starbucks e-Coupon top-up 200 Baht. *Loyal customer means an insured who used to purchase MSIG Travel Easy (Worldwide Travel Insurance) during 1st May 2018 to 30th July 2018.